Manchester United manager Sir Alex Ferguson was quick to play down talk of his side winning the quintuple after their Carling Cup final win over Spurs. They have won the Club World Cup as well and are still chasing the Premier League, Champions League and FA Cup. Ferguson said: "I'm not getting carried away with it, only the media will. We will keep our feet on the ground. "We could go to Fulham in the FA Cup, the ball comes off someone's backside and we are out of that one." United centre-back Rio Ferdinand echoed his manager's sentiments as he refused to speculate on the Old Trafford club's potential for an historic season. "We do not speak about that stuff [the quintuple]," he told BBC Radio 5 Live. "We'll take each game as it comes. We've got an important game on Wednesday [at Newcastle] and fingers crossed we can get a good result there. "We don't get ahead of ourselves and think of which silverware we are going to win next." 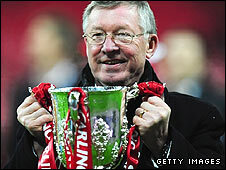 But Tottenham boss Harry Redknapp believes there is no reason why United cannot win an unprecedented haul of trophies. "They have got a big chance - they are the team to beat for sure," said Redknapp after their 4-1 defeat on penalties. "They have a fantastic squad. They have one cup already, it looks as if the league is going their way and you wouldn't bet against them in the Champions League and the FA Cup." Goalkeeper Ben Foster was the United hero, making two fine saves during the game and then saving Jamie O'Hara's penalty in the shoot-out. And Ferguson is confident Foster can go on to cement his place as the number one stopper at the club. "The future is his," added the Scot. "The present belongs to Edwin Van der Sar, that is obvious, but that performance can only strengthen my opinion of Ben's ability and his own self-confidence. "He is a strong character - he has had to be. He has had to come through two cruciate ligament injuries and you have to have something inside you to do that." United's assistant manager Mike Phelan paid tribute to Foster and his team-mates for keeping alive the club's hunt for an unprecedented quintuple. "In the end it came down to the goalkeepers and our one made a great save," said Phelan. "Ben has been unlucky with the odd injury this season, but we know he's got quality and he can be a Man Utd goalkeeper. "It is important he gets games for us and what happened can only help us. "It was a hard game and both sets of players were shattered at the end, they were cramping but they kept going and it's a good feeling when you win on penalties." Foster, playing in only his seventh game of the season for United, was delighted to play his part in the win. "I felt good from the start. I haven't played many games which isn't great, but it was great of the gaffer to give me a chance," said Foster. "All the lads are heroes, they had to knock in the penalties and they looked super-cool, they all looked like they were going to score. "If they hadn't, we wouldn't have our medals. I'm delighted we managed to win." In an innovative move, the 26-year-old admitted that watching Spurs players take spot-kicks on goalkeeping coach Eric Steele's iPod after extra-time had helped him during the penalty shoot-out. "We have done a lot of research into the way each player is going to put their penalty," said Foster. "We went into the shoot-out as well prepared as possible. "We have had things to look at over the last couple of days and before the shoot-out, you can see me looking at an iPod with Eric Steele. "It had actual video on it and showed where players put things." He added: "Eric brought it when he came to the club. I have never seen anything like it. It is a fantastic tool for us." The FA said it had no problem with the use of such technology and the laws of the game.